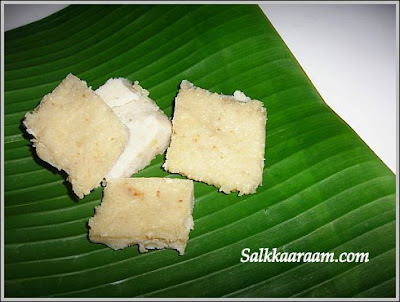 Badam / Almonds Burfi | Simple and Delicious ! This is one of the recipes of Mrs.Mano.I was thinking to ask her what is the difference between burfi and halwas.Any way I forgot to ask and googled for it . I was really surprised seeing the word "halwa" is an Arabic word refers to many sweets! 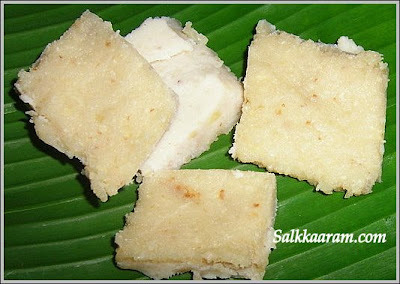 Until this time I thought it is Indian.. :) Burfi / barfi contains milk and that may be the difference. Expert visitors please help.. If you are interested to see the list of Indian sweets, please don't leave this space without checking this page . It is really amazing!! I used water soaked badams for preparing this.Peeling badam is a difficult task always, especially if it is soaked in cold water. The other method, that is adding boiled water to almonds and removing skin is very easy, but I think that swollen almonds would be easy to grind. You can use almond powder too instead. Grind the almonds with enough milk to a coarse paste. In a kadai combine the ingredients. Then heat the kadai and cook the mixture for 20 minutes stirring continuously all the time. When the mixture leaves the sides and the ghee separates from the mixture, pour it in a greased plate. When cooled, cut into desired shape. Enjoy, it is very tasty!! Microwave almond with enough water for a few minutes. The skin pops right out. Burfi looks nice. Wowo delicious. I wish i had a slice now. U can add water and microwave for few seconds ... but soaking is key to peel easily. In my opinion when u fail the burfi u get Halwa (scooping)consistency and if u succeed it is barfi (hard). It depends on sugar consistency (thread) to get halwa or burfi :) U got a lovely color B Burfi! For me, Halwa is semi solid and Burfis are solid and cut into pieces.I love Badam burfis, easy to make and looks delicious there! Surely looks yummy...i love sweets. i'll insha Allah try it soon and inform u..
Coincidence seena,I too posted a burfi in my blog now :) I have made this few times,looks great! Seena,thanks for all those info..I am not much into sweets..yet this badam and milk combo looks great..dear btw,from where you get all these banana leaves ? send some here..seeing them makes me drool actually. Wow...this looks so yummy! The colour of the barfi is so pleasing. Looks delicious & easy to make. Good pictures. Hi Seena, almond burfi is our favourite. I also make in the same way. Inviting pictures , thank you i ahve taken one piece.